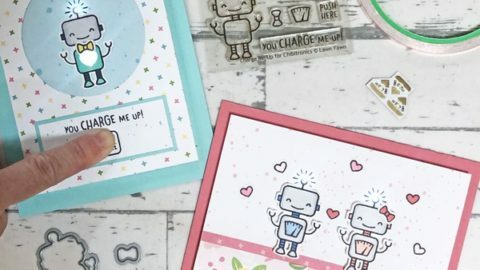 How to make light up double slider card. 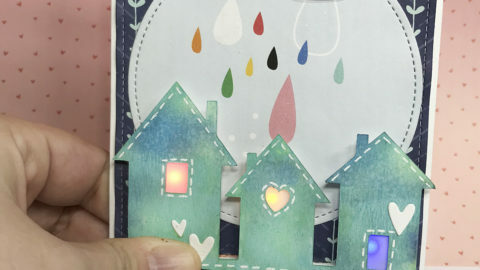 Home How to make light up double slider card. 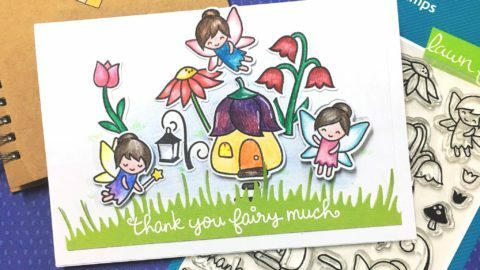 This is Eiko and I make light up double slider card using Chibitronics and Lawn Fawn stamps and dies. When you pull the pull tab, the side panel extends and the heart constellation glows. Two pocket pieces. Die cut one of the two with notch die. 3 x 4.25 inches white cardstock for back panel. Die cut the white cardstock with panel piece and hillside border die. 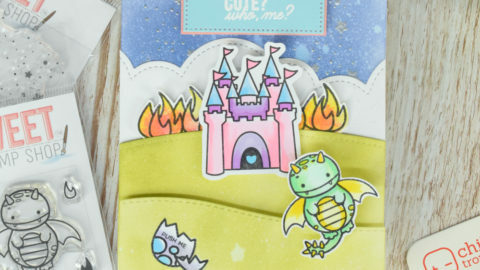 Die cut the white cardstock with pocket piece and hillside border die. Die cut the plastic sheet with track piece die. Die cut the red cardstock with pull tab die. Three 0.5 inch square switch parts. OPP plastic sheet 2.5 inches wide. 2 x 4.25 inches white cardstock for inside panel. Stamp the bears and four trees onto white cardstock. Die cut the motifs using the coordinating die. Stamp the heart constellation onto pocket piece using Versamark. Stamp the constellation and sentiment onto panel pieces using Versamark. Heat emboss with white embossing powder. Using the ink blending tool and distress oxide ink, add in the color onto the pocket and panel pieces. Adhere the border, bear and tree parts on the pocket and panel pieces. Put the colored pocket piece on another pocket piece, mark the position of the lights. Put the track piece on the pocket piece, draw the outline of the track piece. Draw a line 1/2 inch from the left edge of the track piece. Draw a line 1/2 inch from the score line of the pocket piece. Draw three lines at 1/4 inch intervals. Align the left edge of the pocket and panel piece, draw a line at the right edge of the panel piece. Make a 1 mm wide slit between Line A and Line C.
Mark the position of the battery and Chibitronics. Draw the circuit with a pencil. Make sure the negative side circuit crosses the left edge of the slit. Cut out the position of the battery with a craft knife. Put the double-sided tape on the skinny tab of the pocket piece. Adhere two pocket pieces together. Adhere the copper tape on the drawing path. At the position of the battery leave about 1 inch of copper tape and cut it. Make the switch part referring to the picture below. Put the double-sided tape on the switch part. Adhere 0.5 inch square part on the back of the switch part. Fold square parts in half and insert the switch part into the slit. Place the switch part on the left end of the slit and adhere the copper tape. Pull the switch part out of the slit and adhere copper tape around it. Put the circuit card base on the back panel, mark the position of the battery. Put the double-sided tape on the position of the battery. Put the thin foam tape around the back panel. Adhere the back panel on the back of the pocket piece. Peel off the release paper, adhere the negative side copper tape, turn it back and cut it. Place the battery on the copper tape and adhere the positive side copper tape on the battery. Adhere the yellow Chibitronics on the mark. Adhere copper tape on the Chibitronics to reinforce. Put the double-sided tape on the end of the OPP plastic sheet. Wrap the OPP plastic sheet around the track piece and paste it. Cut out extra OPP plastic sheet. Apply the double-sided tape to the top and bottom of the track piece. Place the inside panel on the pocket piece, mark the position of the lights and make the holes at the position of the lights. Adhere the inside panel on the pocket part. Adhere vellum paper on the back of the heart constellation. Put the double-sided tape on the right end of the left panel piece. Put the double-sided tape on the right end on the back side of the right panel piece. Place the switch part on the left end of the slit. Put the track piece on the pocket piece, insert the left panel piece and check the position. Peel off the release paper, adhere the left panel piece on the switch part. Align the left edge of the pocket and panel piece, and place the double-sided tape attached to the slider part on the right end. Adhere the bottom end of the track piece on the pocket piece. Adhere the left panel piece on the slider mechanism. Adhere the top end of the track piece on the pocket piece. Adhere the right panel piece on the slider mechanism. Fold pull tab parts in half and adhere the parts on the panel pieces. Put the double-sided tape on the skinny tab of the pocket piece. Adhere two pocket pieces together. >>>How to make light up double slider card. This is so cool! It is hard enough to do a double slider but adding lights is even more awesome! The colors are so fresh and bright! Great design!